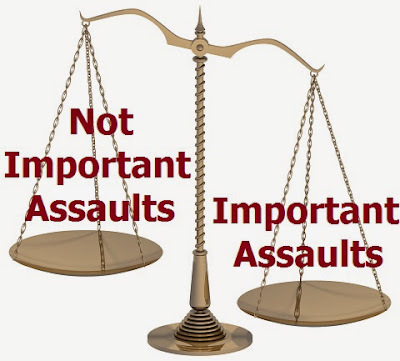 You are here: Home / Ethics / Why is it a Less Serious Crime to Assault EMS, than Other Emergency Responders? Why is it a Less Serious Crime to Assault EMS, than Other Emergency Responders? If EMS is not allowed to be armed, the laws should be fair. Is an assault on any emergency responder less significant than an assault on any other emergency responder? Image credit for original image. Isn’t this the message that the Colorado Legislature has been sending? Some assaults on emergency responders are more equal than others. A house bill granting emergency medical technicians and paramedics the same protections against assailants as police officers and firefighters was referred to the Judicial Committee for further review Wednesday. I disagree with some of what is presented in the video. While we may be assaulted by diabetics with low blood sugar, or other patients with medical causes of disorientation, this should not be the reason for the change in the law. These are conditions which we treat medically, not with criminal charges. A patient who becomes disoriented is not legally responsible for behavior while truly disoriented, so this law should not change anything about the way that the law is applied. We do not imprison people for medical conditions. We treat the medical conditions. Currently, 38 states have passed similar legislation protecting EMTs and paramedics. What other 11 states that see a need for some difference in assault laws? How did a majority of legislators (in Colorado and 11 other states) vote to treat assault on EMS personnel as less serious than assault on other emergency responders? The bill must make it to the senate floor before the end of the current session May 7, or it will have to be reintroduced next year. Are there other emergency responders treated differently, if so, the law should be changed for them, too. I do not think that EMS should be armed, because I do not see a benefit, while I see a lot of potential problems. If we are not armed as well as the police, why does the law make us even more of a target to those who are violent? Does anyone oppose treating people equally under the law for the same offense? Having only read the one article (I need to read more), I will offer that I am not in favor of charging a hypoglycemic diabetic who swings at me with a misdemeanor, let alone a felony. I understand the whole ‘altered mental status’ thing. With that said, if you are altered, whether by drugs or alcohol in my state, and you take a swing at a police officer, aside from the felony charges, it is going to earn you a ‘physical exercise in submission’. There are a number of cases in the news of patients and family members, who are not hypoglycemic, septic, or suffering from a medical condition, assaulting EMS personnel. I think that this is what they are trying to address. It also highlights a disparity. The report notes the differences afforded to employees of private EMS agencies. In my home state, assault on a government official is a felony. I work for a government agency, so I am a government official. However, several counties in my state are served by hospital-based EMS agencies, hence, no ‘government official’ status. The same is true with line of duty death benefits. In one county where I worked, if for example a drunk driver crashes through a wreck scene and kills one firefighter, one police officer, and one paramedic, the firefighter’s and police officer’s families are eligible to receive the Public Safety Officers Death Benefit, in addition to any life insurance policies. The paramedic’s family gets his life insurance policy, which will be far less without that $100k or so PSODB kicking in. Same wreck, same job, diferent treatment. That is the way I interpret it. In the video, the paramedic’s statement (not edited by him) seemed to be suggesting that disoriented patients, such as diabetics, are a problem and the reason to change the law. I would not be surprised if his comments are cut to the point that their meaning does not reflect their original context. People outside of EMS, such as those with diabetic family members, might think that this change in the law would affect them, so I felt that I should make it clear that medical causes of disorientation are not the target of the law. The agitated/violent diabetic should be given sugar/glucagon, not arrested. The agitated/violent dementia patient should be sedated, not arrested. The agitated/violent intoxicated patient should be sedated and taken to the ED for assessment of possible medical causes of agitation. Legal consequences take place after the fact, when the medical factors are known. With that said, if you are altered, whether by drugs or alcohol in my state, and you take a swing at a police officer, aside from the felony charges, it is going to earn you a ‘physical exercise in submission’. There are laws prohibiting that kind of behavior by the police. Bad things happen to good people and good things happen to bad people, but beating up on someone we suspect of being just a drunk just a violent drunk is a corruption of police authority and should be opposed. What about a hypoglycemic diabetic who CHOSE not to take the prescribed medications and summons EMS DAILY? At what point is their behavior or choices detrimental to all EMS providers. Lets throw this out there. Diabetic who refuses to take the necessary steps to control a CONTROLLABLE condition summons EMS. We rush to their aid, lights and sirens and we get into a traffic accident. Or how about the same diabetic assaults providers and during the incident, the responders protecting themselves cause an injury to the patient..